The Office of the National Coordinator for Health IT (ONC) is planning to assist small- and medium-sized medical practices in securing their mobile devices. The new project aims to educate providers on security needs and simple methods to safeguard devices which can be easily lost or stolen. Over three-quarters of physicians are using smartphones or tablets, but many of these practices may not have dedicated IT personnel or a third-party vendor managing and securing the devices. The first phase of ONC’s project will offer practical information about security for mobile devices and discuss connecting personal devices to a practice’s network. ONC also plans to develop best practices for mobile device security, to be published online in the fall of 2012. 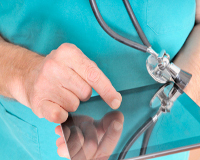 Mobile devices like iPads can be used in conjunction with a Wide Area Network (WAN) to access Electronic Health Records (EHR) systems such as Medisoft Clinical and Lytec MD. Healthcare technology consultant Microwize Technology can help.